Feeding & Stacking InkJet Conveyor is one of the best equipment designed and fabricated by Shri Vinayak Packaging Machine Pvt. Ltd. 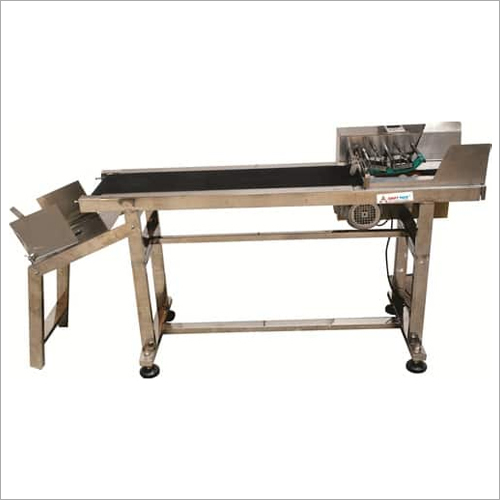 This specific equipment is regarded as an exceptionally versatile conveyor, whose functions are similar to that of standard Stacking InkJet Conveyor, but it has several additional features which makes it a most professional and efficient machinery. Its unique design allows simple and quick cleaning for smooth operation. Its speed can be adjusted and additional option can be provided for operating in reverse direction. Since inception, the company has been carving strong excellence marks in the industry. Supported by expertise and know-how of professionals in the field of manufacturing material handling equipment, we have been catering to needs of many small and large companies across multiple industrial sectors; consequently attaining a leadership position in this competitive market. We use stainless steel and other material to construct these Feeding InkJet Conveyors. Its rugged constructed bestows it with the ability to perform in all environments with highest efficiency possible.